Many folk I speak to are surprised that there is lift served skiing in England. To my current knowledge (Feb 2018) there are five ski areas in England. 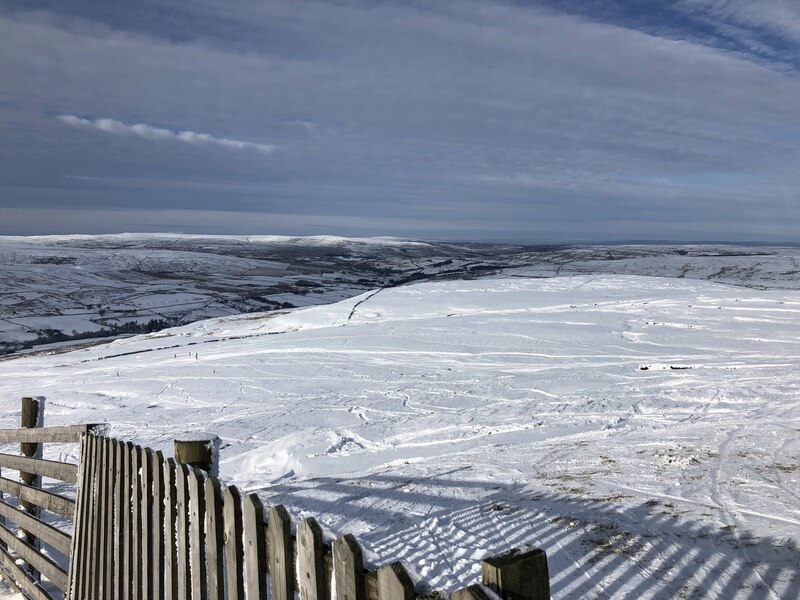 Yad and Weardale historically has managed lift served skiing between 5 and 45 days a season. PLEASE NOTE – depending on conditions and weekends some of these areas are members only. Please check the specific websites before travelling! 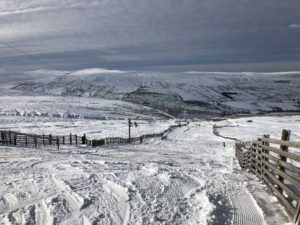 YadMoss – My “local” area, The ski area is served by a fast Poma tow of 600m length and 125m vertical rise. In good snow conditions there are 8 blue/red ski runs of up to 800m in length. 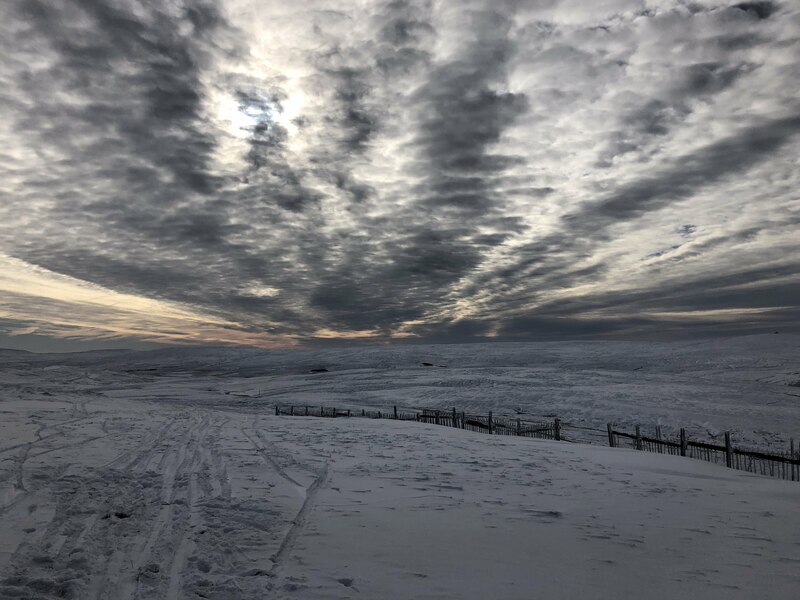 The highly variable snow cover and rough moorland terrain mean that it is not possible to mark each run in the same way as an ‘alpine piste’. Instead the ski runs are lined by snow fences or otherwise follow shallow gullies or areas where the grass has been cut shorter. Snowsports are often only possible at Yad Moss because the absence of rocks and the grassy surface enable skiing on very thin snow cover. The Lake District Ski Club (Raise) – Founded in 1936, the Lake District Ski Club operates a 360-metre button tow on Raise, next to Helvellyn in the Lake District National Park. An hour’s walk from the mines at Glenridding, Raise is positioned for the best snow in the Lakes and the tow gives access to a substantial part of the mountain. There are up to nine runs available, depending on prevailing conditions, the longest of which is almost a mile. Raise’s ungroomed slopes provide for a unique experience, with a total of sixty days of skiing enjoyed during particularly good seasons. While it is an austere environment, we have a very cosy heated members’ hut! Ski Allenheads – The skiing and boarding facilities at Allenheads are provided by Ski-Allenheads, (formerly the British Norwegian Ski Club) who have developed the facilities over the last 40+ years. During the late 70’s and early 80’s, we regularly had 4 to 5 months skiing each winter, a season almost matched in 2010 with skiing every day for 3 months. Most years won’t match those times, but we can expect a few weeks of suitable snow most winters. 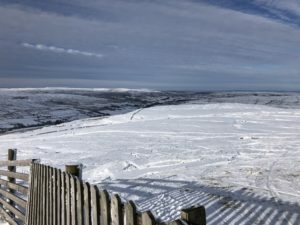 The position of the slope and its situation in the upper Allen valley means it captures any snow that is going and can support skiing with barely 5 – 10 cms of snow. Another World – has been skiing and snowboarding here, high in the hill of Halifax for years. We have three main slopes, none are very long (longest is around 500ft), but they are wide, varied, in breath taking surroundings and OUTDOORS.